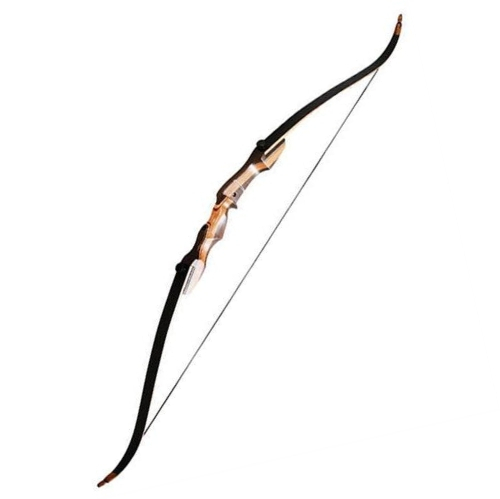 62″ is an ideal size for any traditional recurve bow for straight and stable shooting. It is not so much high or not so short for any novice or professional American archer of average height 5-½’ or above. Yes! We are talking about the most elegant and adorable Samick Sage takedown recurve bow. It is the best recurve bow under 200 which comes with B-50 string and arrow rest, very few bow makers include this in their package. Not the end here, the essential part of any bow is the riser; Sage build it with the best quality Dymond wood and Maple, and the limbs which made of fiberglass ensure durability year after year of continuous uses. Are you finding the best recurve bow? Along with 900+ satisfied customers my choice is also the number one Samick Sage 62 takedown recurve bow. As it perfectly snugs with your budget without compromise the quality what you desire. If you know about the Samick, you certainly understand why I’m so confident about their product Sage Takedown Recurve Bows. The Samick Sports is a Korean company born in 1975. Since then it grows gradually and keeps its mark on the bow industry with dignity and trust. Samick Sports exports its products to more than 50 countries around the globe. It’s a customer oriented company and always emphasize on after sales service. Not end here, we have some more points to tell you which we will try to discuss in our product features and reviews part below. Wish you stay with us in getting ideas about Samick Sage Recurve Bow which will guide you to purchase right product according to your purpose. 25, 30, 35, 40, 45, 50, 55, and 60 lbs. Earlier I have said that the most essential and attractive part of the Samick takedown bow is its riser. They made it beautifully. You can change the limbs and other parts especially the arms of a recurve bow easily if the central portion that is the raiser last long. However, Samick builds every part of its bow with intense care, which reduces the chances of breakdown tremendously. The riser comes with pre-drilled and bush settings which allows you to set any necessary accessories like sight, stabilizer, arrow rest or quiver. Besides it enhance its look, the raiser of Samick Sage made of high-quality wood too. It built from the best quality Asian trees Olive Dymondwood and Maple. The combination makes the raiser more resilient and sturdy. What else you want from a riser? Simple but beautiful design, durable, pre-drilled to allow accessories, and most of all useful for any beginner or seasoned archer to practice target shooting or hunting game or archery competition. The Sage takedown recurve bow offered a wide range of poundage like 30# 35#, 40#, 45#, 50#, 55# and 60#. Thus, the 40# or higher is the best choice if you are a seasoned archer. On the other hand, if you are a beginner and or young man or adult women 30 to 35 pounds draw weight is perfect for you to start. With a 35# bow, you can shoot up to 30 yards distance without any problems. However, draw weight depends on draw length. The difference of every inch of draw length, draw weight is increase or decrease by 2½ pounds. Suppose your draw length is 28’’ then your recommended draw weight will be 45#. In our buyer's guide, we showed the process of how you can measure the draw length? Not only that, the tips of the limbs reinforced with phenolic resins. As because of this you can use any upgraded strings like Fast Flights in this bow.More importantly, you can detach the limbs from riser with almost no time as it allows unscrew by free hand. As it is easy to separate and easy to connect the limbs, you can use it during your trips to hunting with comfort. Also, if you want to change the limbs in the future for an upgrade to a higher poundage, you can do it effortlessly and cost-effectively. Finally, I can say that the limbs are flexible and robust enough that the chance of twisting is near to zero, so you can rely on it. It is also available in both hand orientation. To choose your dominant hand, you have to check both your eye and hand strength together. Sometimes its observe that your right-hand is more potent than left-hand, but in case of the eye, the left side is more dominant. In that case, if you choose a right handed bow that will be not a wise decision. You purchase a bow for target shooting, archery practice or hunting whatever you like most. In most of the cases, the available bows in the market are not suitable for both hunting and target shooting. However, the full range of draw weight of Samick takedown bow facilitates you both hunting game and shooting practice. That why it’s a perfect beginner bow too. For hunting, the recommended draw weight is 40# or more. With this poundage, you can shoot up to 30 yards quickly. The speed and depth of penetration of an arrow are not only depended on the draw weight, but bow length is also a factor. However, for big hunting game (elk or deer as an example) 45# or more is the recommended weight. Q. Does it come with string? If yes, is it need to twist before assembling? Answer: Yes! It comes with Dacron string. For better performance, it is necessary to twist the bowstring before assembling. Q. What is the range of brace height? Answer: The recommended brace height range of Samick sage is 7 1/4 inch to 8 1/4 inch. Q. What is the difference between the Sage and Journey? Answer: The sage comes with 62’’ bow length provide max 29’’ draw height which is suitable for medium height archer. However, if you are over 5’-6’’ then you can go for the Journey as it is 2’’ more and better for the longer archer. Samick Journey Takedown Recurve bow is an exact copy of Sage except for the bow length. The limbs are a jiffy longer than the Sage which makes the amp length 2’’ higher that is 64’’. Otherwise, it comes with all the same features as like Sage. As because of longbow length Journey is more forgiving in nature than the sage. Due to extended bow length, you can get a higher draw length, and that is up to 32’’. It will help you in the time of hunting, but Sage is also an excellent choice for target shooting by the beginners. Sypder is originated or designed by the same people who manufactured Samick Sage Killer or V2, but the Southwest Spyder marketed by the different company. Spyder comes with more elegant looks and better finishing. It is lighter and more durable than Sage within the lower price range. It will give you options to choose your suitable poundage from its wide range of draw weight starting from 20# to max. 60# and also available in two different bow length 62’’ & 64’’. You can change the limbs with Samick limbs too. If you want multifunction archer like for hunting, archery and bow fishing than it is perfect for you. However, Sage give you the opportunity to assemble and disassemble within a minute without using any tools, but in the case of Spyder, you need tools to do so which is a little hassle thing. SAS Courage is decent looking traditional takedown bare bow. Those who like martial arts this bare bow is ideal for them. It is also a sturdy and efficient bow for serious archer. It comes with a vast range of draw weights. The riser made of good quality hardwood and limbs from fiberglass. It covers with 3 years warranty by Southland Archery Supply. Overall it is a better quality bow; the only downside is its bow length, 60’’ is a bit challenging for the beginner archer. Wish our Samick Sage takedown recurve bow review is like by you and will help to make your decision. Samick Sage is very easy to assemble and ready to play immediately after unboxing. So those who are looking for an excellent takedown recurve bow under the range of $200 it is the best choice for them.